Hello everyone! I have some exciting news to share! I was asked to be the Design Team Coordinator over at a2z Scrapbooking and I am so excited!!! a2z Scrapbooking is an online store that specializes in selling Hero Arts Stamps. It's been a crazy month getting everything together but we did it and I am so excited to announce that today is our very first challenge over there! I used a technique that I saw on Jennifer McGuire's blog recently. You can see her video HERE. Now for some GREAT NEWS!!!! a2z is offering a wonderful treat for my readers. Just head over to the a2z Scrapbooking and when you have finished shopping use the code: MICHELLE15 and you will automatically receive 15% off of your order!!! How cool is that? Please stop by the a2z Blog and leave the girls some love. They did a FABULOUS job on this challenge. We would LOVE to have you join us. 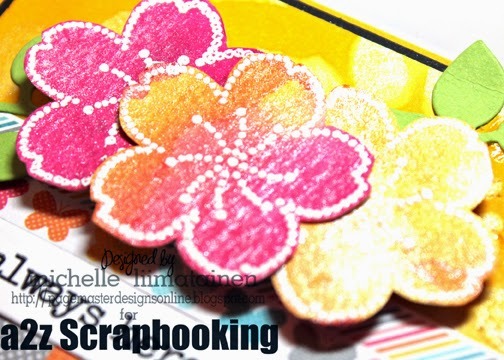 The winner will win a $25 Gift Certificate to the a2z Scrapbooking Store. We will also be showcasing many other projects throughout the month. Every single day you will be able to get inspiration from cards, to scrapbook layouts, to mixed media and everything in between. Michelle, nice card! Happy to be on the A2Z design team with you. Michelle, nice card! I'm happy to be on the A2Z design team with you! Beautiful and congrats to you!! I love that you used Perfect Pearls with your distress inks...it really makes all the difference in terms of texture and shimmer! I love the color combo, too! Awesome card, Michelle!